I am looking for poems for Year 6 which evoke senses and emotions and encourage them to collect good memories of their time in primary school. What a brilliant idea with Year 6 ! A blindfold game :guessing by taste or smell or touch. First share with the class a tray of items of familiar target language items. Ask children to come to the front and label these objects on the tray.selecting the correct noun from a variety of h target language word labels . Now hold a smell,touch and sense experience guessing game,where you challenge volunteers to touch , smell and sense the items without being able to see them. What fruits they can smell? What foods like chocolate or coffee they can smell? What smells and touch sensations of classroom equipment they can guess (crayons/paints/pencils/paper/books)? Rmember that you should use items that the children already know as target language word.Enourage the children to utter their guesses using full sentences or questions(if they are uncertain) too? Share the text with the class and read the poem for the class. Ask them to smell and sense and imagine that they can touch the items mentioned on the poem. Can they tell you some facts about the poem and the smells and objects are mentioned? You could create a pictorial list of the items on the flip chart as the children read about the objects in the poem. How are they going to do this ..? Ask them to create a "doodle senses poem".This is a poem where the children literally doodle or scrobble on the written poem, to remove some of the text and leave a [partal text that shares the message of the poem.In this instance the children should be left with the key items and memories of the poem. They will need copies of the text and a black pen or a pencil. With a black pen or pencil they need to colour out words they don't know and then see what doodle smells and senses they are left with. Some children may want to work in pairs and you may decide to ask a TA to work with a small group of children to guide them through the text. I feel that our children should after four years of language learning have most of these words in brackets "undoodled"because they are familiar to them. Ask the children to read their comppleted doodled poems to each other.This will be essentially the list of language they have left. 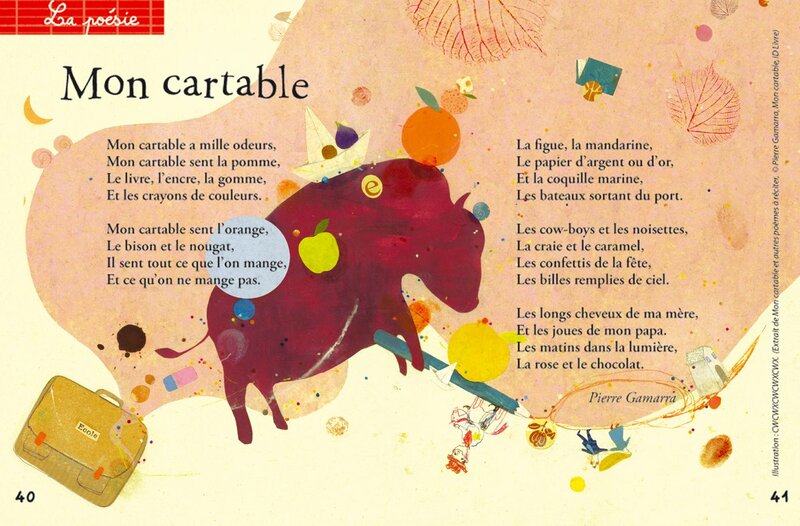 Mon cartable: a place to keep their own happy memory sensations of primary school. Now ask the children to fold a piece of A4 paper or card in half and create their own cartable. Can the children then add five objects,five colours and five smells or tastes of school that they know they won't forget and that will be good memories when they think of school in years to come?